THE GOLDEN VOYAGE OF SINBAD—-“Trust in Allah–but tie up your camel.” Back in 1974, this was great for kids: now it’s a relic. 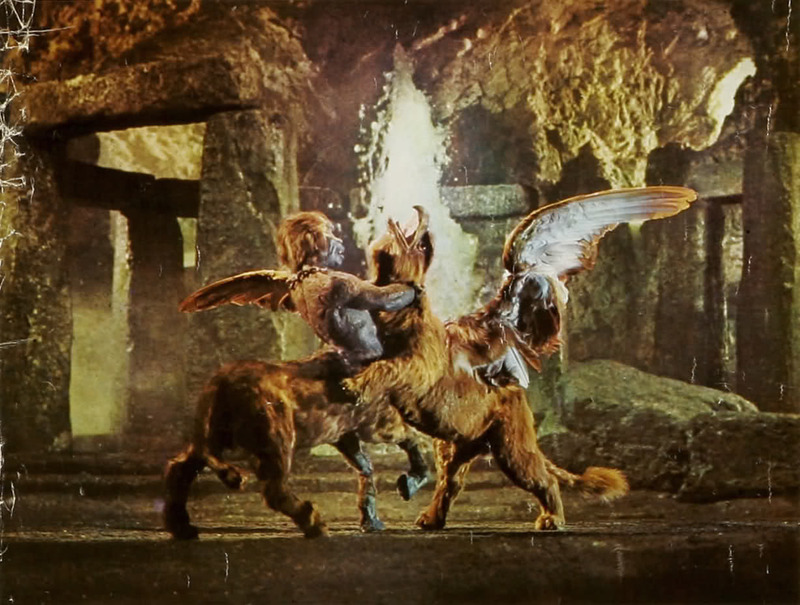 The production and special effects team of Charles H. Schneer & Ray Harryhausen, responsible for great fantasy adventures such as Jason And The Argonauts, collaborate again, pitting noble foolhard Sinbad against another array of stop-motion monsters, another hot princess in flimsy attire, another bad guy with a lust for destruction. 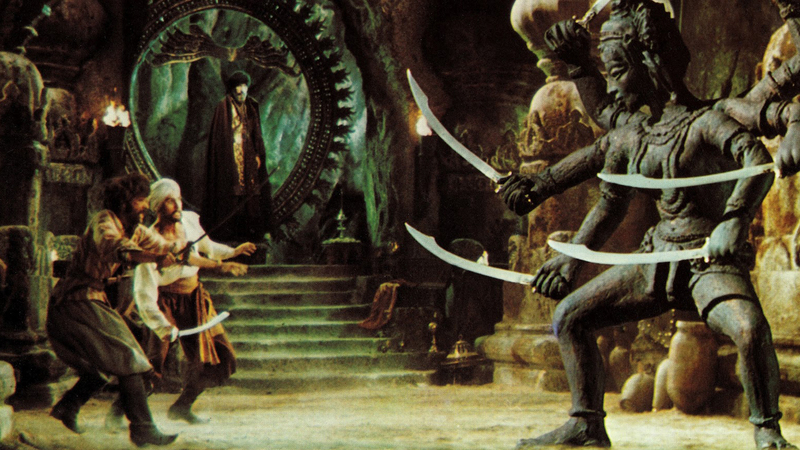 What’s good are some of the visual creations, best being a six-armed statue of the goddess Kali, who comes to life with the idea of dicing the leading man in a swordfest that makes you wish you were nine years old so you could really get into it. Also eye-popping is the personage of Caroline Munro, constructed like the proverbial brick minaret: tanned, panting and costumed straight from Frederick’s of Damascus. Decent as well is the properly exotic musical background from Miklos Rozsa. What isn’t good is the overall production effort: it has a rather static, penny-pinching look. Instead of a budget, locales and camerawork that effectively place you in a viable Make-Believe Situation, ala Jason, they seem just adequate enough to get across the next effects sequence and keep the story moving. As to the story and script, they’re flat. 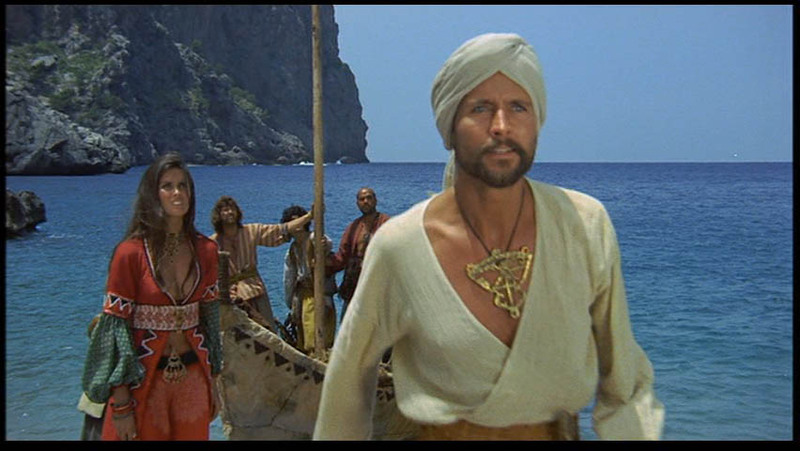 Even flatter is the lifeless impersonation of the hero from John Philip Law: was Sinbad a Cretan? Requesting another round of Chi Chi’s at a yacht party on Newport Bay is one thing: ordering a crew of roughnecks around the Red Sea, fighting monsters is something else entirely. It runs 105 minutes, was directed by Gordon Hessler, co-stars Tom Baker, Douglas Wilmer, Gregoire Aslan and John Garfield, Jr.(!) At least it’s better than Sinbad And The Eye Of The Tiger. We’re overdue for a big-time rework of Sinbad. I vote for Dwayne Johnson, before he gets too old. Now, back to my pet cobra…. 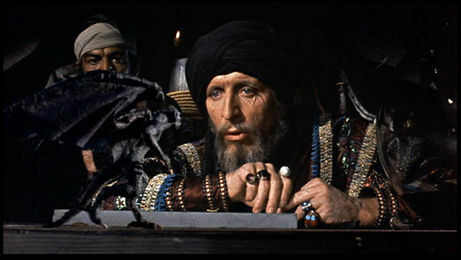 The restrained budget ($ 982,000) ensured that with a take of $11,000,000, the producers were happy as caliphs. Such good fun. I love the effects and the costumes in these films.